While visiting San Francisco I was fortunate enough to experience the view of the Golden Gate Bridge at sunset from Marina. However, reflecting back on the trip, there&apos;s another Marina-related-memory that sticks out in my mind, particularly around lunchtime. My good friend was kind enough to take me to his favorite sandwich spot, something San Franciscans have been enjoying since 1975, Marina Submarine. The small-staffed, cozy sub shop has a solid list of offerings, with sandwiches that come in either a 5" small, 7" medium, or a 10" large. A few enticing options popped-out at me from the menu, but I ultimately decided on both the most expensive and most interesting sounding option—The Atomic Submarine. I was a bit hesitant at first because I&apos;m not a fan of anything resembling a cold cut, but I was rewarded for taking a chance on the awesome ensemble of hot pastrami, oven-roasted turkey breast, corned beef brisket with cheese, and "Marina&apos;s own" hot peppers. It took a little while to prepare, considering the same man who checked us out at the register prepared both of our sandwiches (my friend grabbed the Turkey Breast Sub). Luckily we avoided any rush, making our trip to the eatery late on a Thursday afternoon. 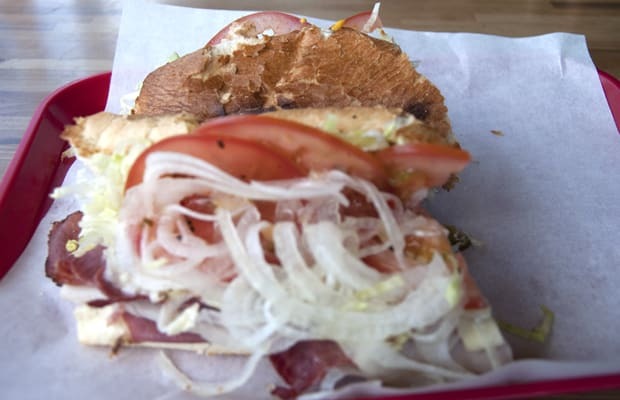 First thing you realize when the sandwich is sitting right in front of you—especially when you&apos;re trying to resist taking a bite in order to take a picture—is how tremendously fresh what you just ordered smells. The onions look as soft as dandelion seedbeds, chances are the tomato slices will be the largest you&apos;ve ever seen, and you&apos;ll presume the ingredients are all so fresh they must be made locally; all this and you haven&apos;t even bitten into it yet. Once you do, you&apos;ll then realize how large a medium actually is, but once you actually taste it, you&apos;ll be happy to fight to wrap your mouth around it. The more-sweet-than-hot jalapenos are the first flavor to arouse your taste buds. After that they&apos;ll be sent on a journey, pleasantly surprised by the effective layering of cheese and meat throughout every juicy bite. And the Atomic Sub has the perfect distribution of juiciness covering the entire sandwich: enough so that it drips off onto the wrapper below, but not so much as to make a mess. I thoroughly enjoyed my Marina Submarine experience. They successfully got around my aversion to cold cuts by placing the Atomic Sub in the oven long enough to toast the bread and slightly warm the contents. I found my medium sandwich with a side of chips to be very filling, but not to the point where my stomach felt too heavy—perfect for lunch. This was easily my best sandwich experience while in SF, and that says a lot.